I’m in love, I’m in love and I don’t care who knows it!!! 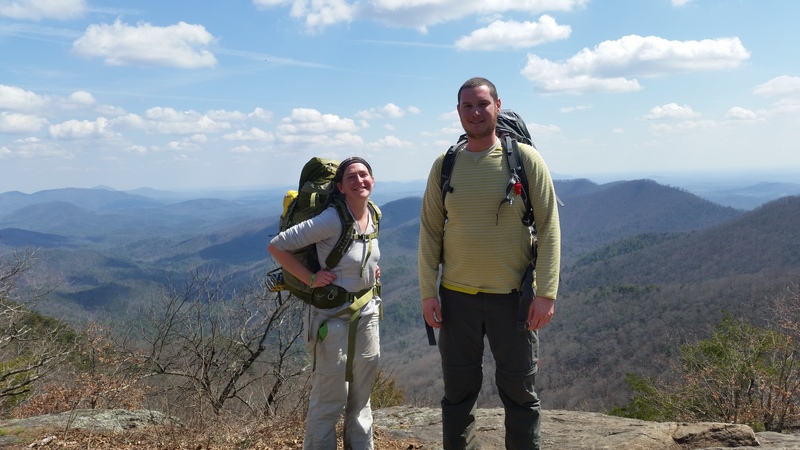 Wow, the first few days on The Appalachian Trail (AT) have been one heck of a ride. A beautiful challenge, a wondrous gift, an awe inspiring blessing. Casual lunch with a view. They say there’s a honeymoon period between hikers and The AT towards the beginning of the trek. Well, I’m hoping this smile doesn’t fade anytime soon. So far, so good. The views are incredible, fellow hikers look out for each other, and the entire community in the area supports thru-hikers. They want you to make it, and don’t mind giving a hiker a hand (or extra soda) when in need. Sean and I spent the night in Chattanooga, Tennessee with his cousin before the adventure began. We went out for a final pre-trail dinner and discussed his cousin’s thru-hike that he completed in 2011. He calmed our nerves and was very encouraging. We felt as prepared as we were going to get. Beautiful parting words from Shel Silverstein. In the morning, Sean’s parents drove us the rest of the way to Amicolola Falls State Park where the 8.8 mile Approach Trail begins. The Approach Trail welcomes you with a daunting 600 stairs, but graciously gives back with gorgeous views of the falls. The Approach Trail ends at the summit of Mount Springer where The Appalachian Trail officially begins. Technically, those 8.8 miles (and stairs!) 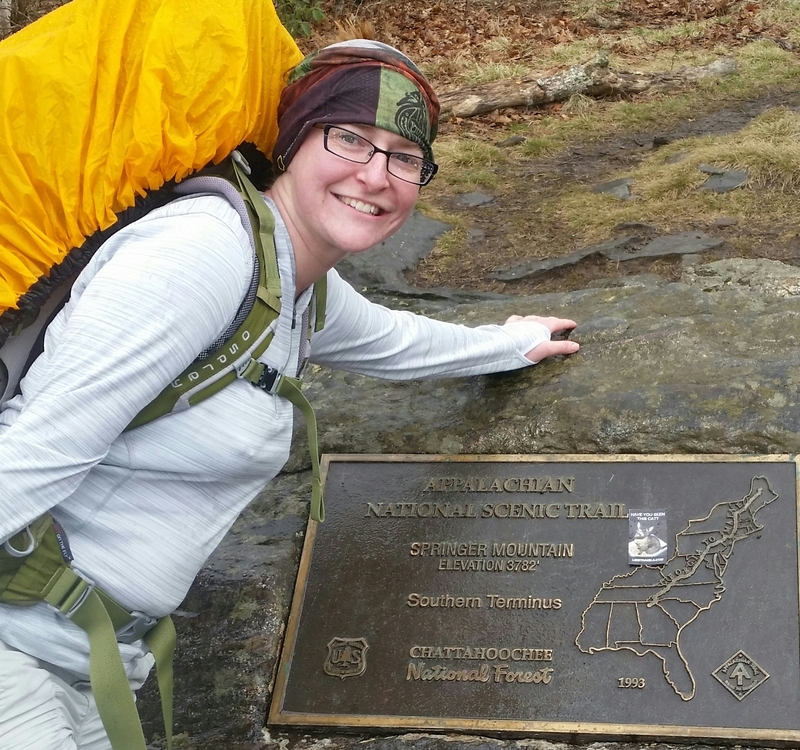 “don’t count” towards the 2,189 miles on The AT. Day 0 was rainy but our spirits were still high. The stairs weren’t so bad and the falls were worth seeing. 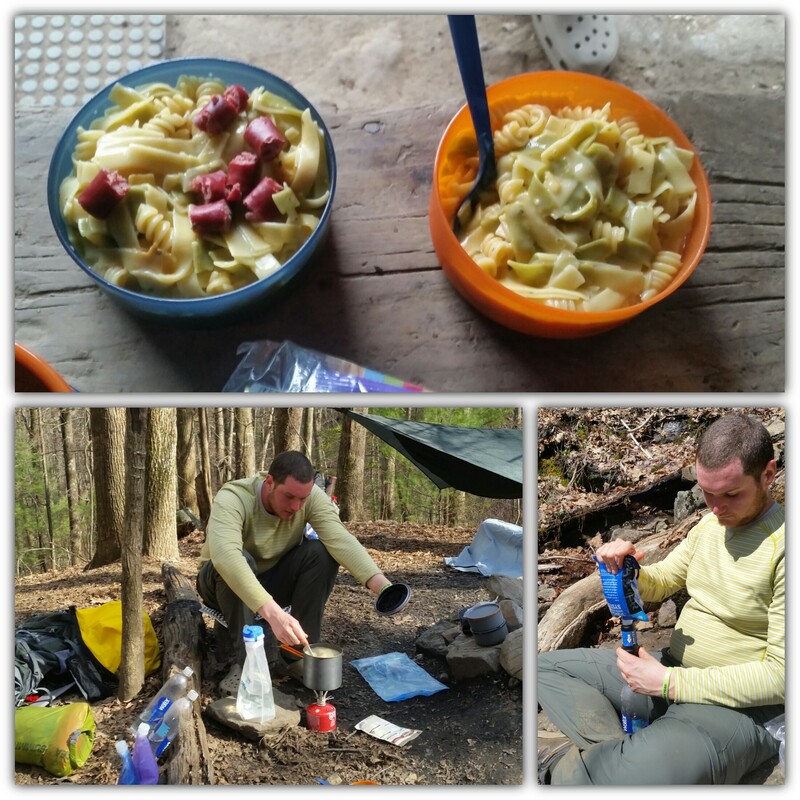 After completing the Approach Trail, we made some food and stayed at a dry shelter near the summit of Springer. We went to bed probably too early thinking about the long days ahead. 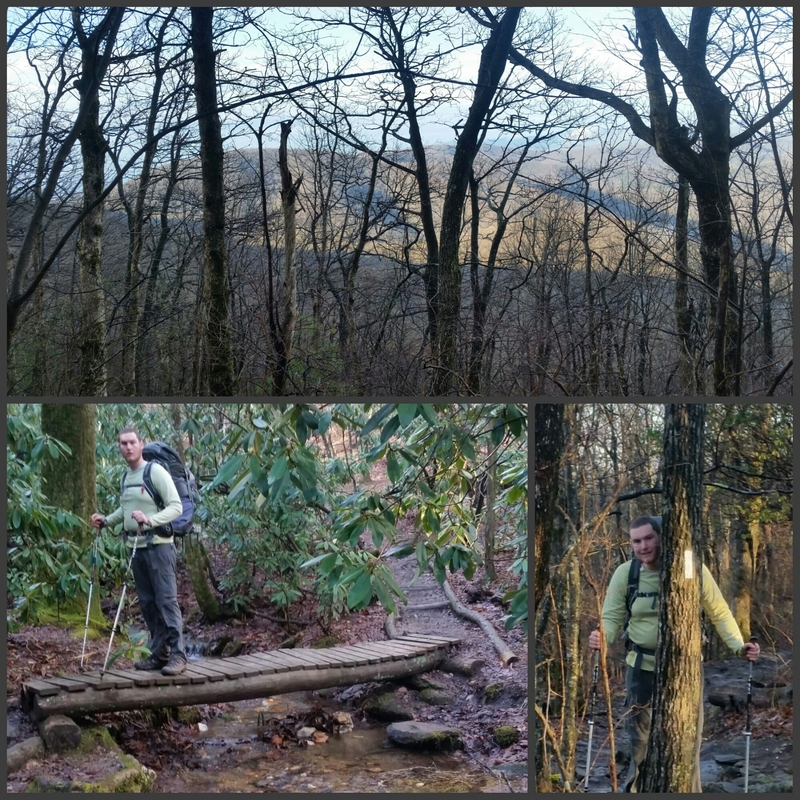 Day 1 (on The AT). Sun! We made coffee, had breakfast, packed up, and were off by 9:00. We walked a brisk 7 miles under a brilliant, blue sky when we came to another shelter. Really happy with these surroundings. Lower right is one of many of the White Blazes that will guide us along The AT. It was about noon and we were still feeling like moving. We had some lunch and made our way. We kept walking up and down mountains and headed to the next campsite near water. We finished the day in good time (around 5), but realized we pushed our bodies a little too hard for our second day! The AWOL guide quoted our day at 14.2 miles. I felt a bit faint coming into camp, but was able to eat my way out of it. Lesson learned. Eat! And eat often! Day 2. Word on The Trail was there was trail magic at Gooch Gap. What’s Trail Magic? Some beautiful souls known as Trail Angels set up camp where The Trail crosses a road. These lovelies gift hikers snacks, sodas, and even full meals on occasion. Food is a hikers best friend. After breaking down camp, we made our way 1.4 miles into Gooch Gap and met the legendary Trail Angel, Miss Janet. Miss Janet and a group of helpers passed out sodas and had Fruit Loops with cold milk. Trail Magic from Miss Janet at Gooch Gap! We finished the day at Lance Creek completing 9.9 miles. We set up the tent, filtered water, and started cooking. We seem to be forming a routine for life on The AT. That evening, the campsite held approximately 30 other hikers (most of them also shooting for Maine). We’re all starting to get to know each other and creating “trail names.” Sean has been dubbed Big Foot. We’re hiking with Radio, Two Sticks, Hot Wing, Foxy, and Pippi to name a few. Mine, like many others, is yet to be determined. The night ended with a chit chat over a campfire. The clear sky sparkled with stars and a crescent moon. We really felt right at home. Day 3 began with dense fog. We broke down camp and made our way. Everyone was in good spirits today. 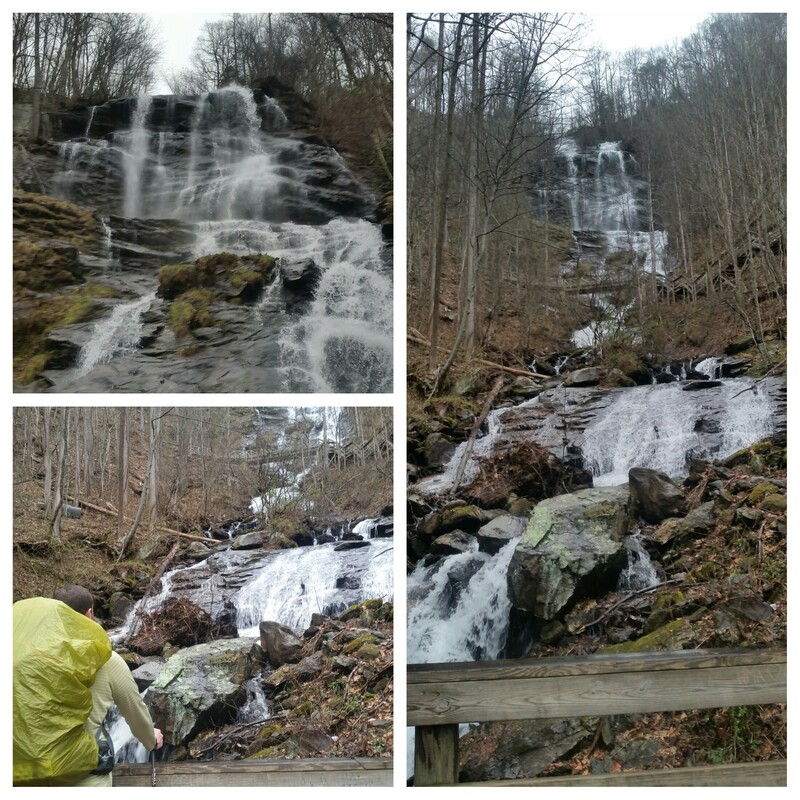 The relatively short 7.4 miles included the hike up and down Blood Mountain and ended at Mountain Crossings in Neel’s Gap. Mountain Crossings is directly on The Trail, literally the only point were the trail goes through a building. There, you can do a full resupply, “shakedown” your pack, buy improved gear, and even stay at the hostel if you are ready for a real bed and a shower. Sean and I enjoyed the hike up and down Blood Mountain in the fog. The summit is known for some of the best views of Georgia. Well, just fog today. Apparently sometimes you can see Atlanta from the summit. The fog had it’s own mystery that we quite enjoyed. Climbing down the mountain was a bit tougher and involved a rock scramble. Around 2, we were happy to get to Mountain Crossings. We were warmly welcomed and greeted by many familiar faces. Mountain Crossings hangs the shoes left behind. Ooh… something else familiar! Our first drop box we sent ourselves before we left home was waiting for us at Mountain Crossings. We sorted our goodies, set up camp, and were able to charge our phones and clean up a little. We heard a little rumor about the possibility of more magic that evening. And what do you know? Dinner arrived. Wow, what a blessing! 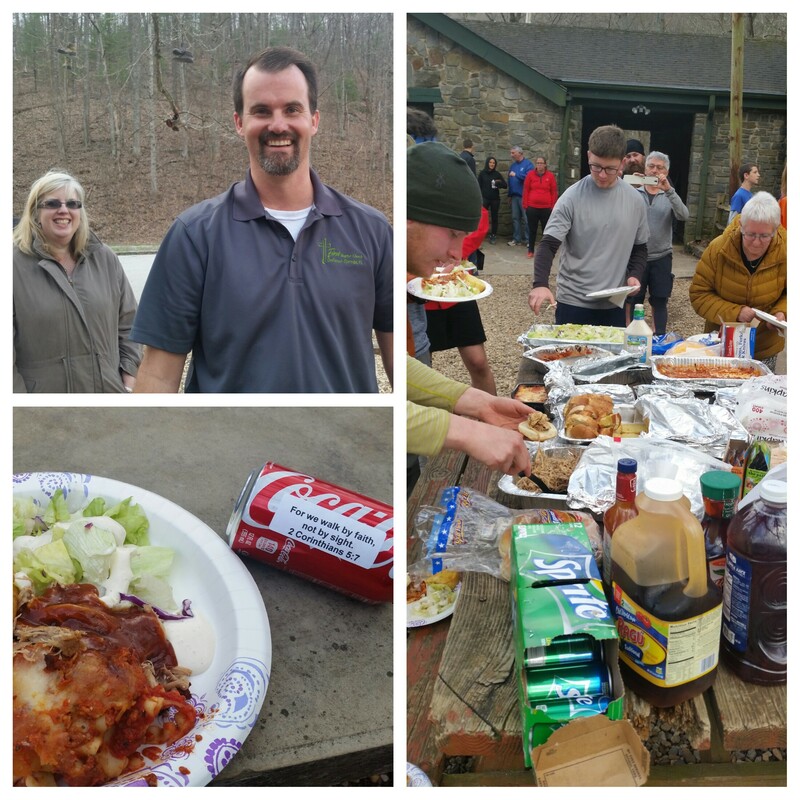 A church family from Florida decided to spend their spring break on The Trail feeding thru-hikers. They showed up with multiple trays of meat lasagna, veggie lasagna (how thoughtful! ), garlic bread, salad, pulled pork, soda, sweet tea, and cake. A huge thank you to the First Baptist Church Family of DeFuniak Springs, FL!!! I almost cried my tears of gratitude. All of our heaping plates were devoured in minutes. We all sang our praises for this special gift. I got a chance to chat with them a bit and give them a little insight to what we’ve been up to out here. The adults were about to head to Guatemala in a few weeks for their annual mission trip. The kids seemed like they were really enjoying their time out here. Believe me, their generosity will be remembered for a miles away. Well, it seems to me this will be the routine on the trail. Breakfast, break down camp, walk, snack, walk, walk, snack, walk, set up camp, filter water, eat, sleep, repeat. We’re at mile 31.7 and also completed 8.8 on The Approach Trail for a total of 40.5 miles. Not bad. Although it most certainly hasn’t been easy, our spirits are high and really… I can’t think of a better way to spend my time. Wish us luck. Only 2153.6 miles until Katahdin!!! This is so exciting! Wonderful narration skills by the way. I wish you the best guys! wooo hoo! 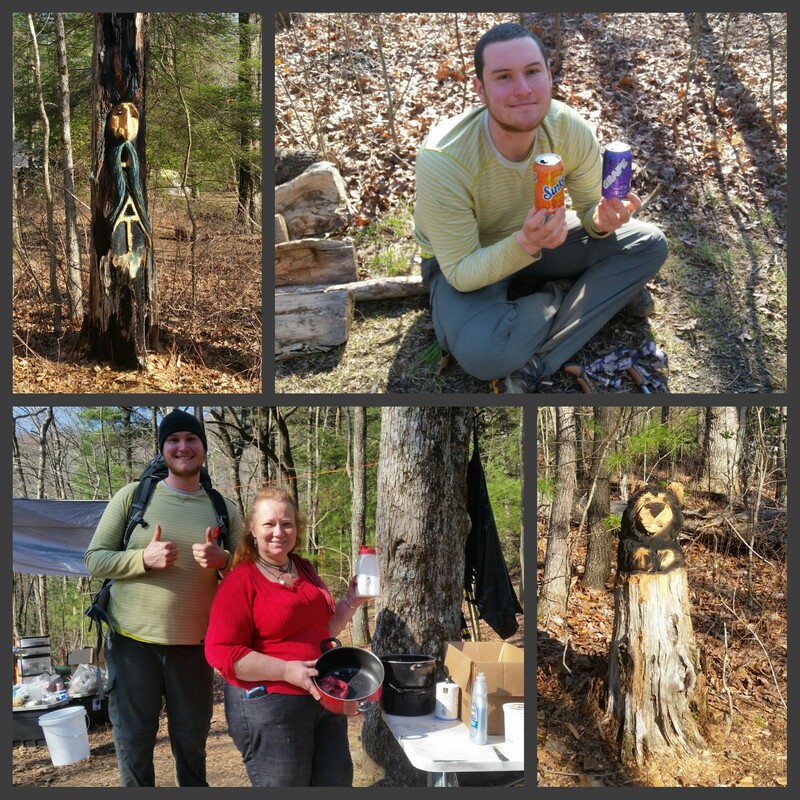 great pictures and so much trail magic, keep it all coming! We’ve been very fortunate! Follow along!! We wished we had seen you in Chatanooga before you left for the trip. We got there too late. We wish you all the best of luck! !We will be be following your blog though! Just barely missed you! Thanks! Follow along, we’re really enjoying ourselves so far!!! It is!! We are (literally) happy campers!! Thanks doll! Congrats on your adventure as well. Life is cool!!! More pictures! More blog! Hope you two are safe, well, and enjoying it all. You two must be feeling the physical benefits by now! More coming very soon! Thanks! Still really happy out here!